Clarets boss Sean Dyche accepts his side is yet to fire – but is delighted to still be picking up points. Burnley went into the international break ninth in the Championship, on the back of two-successive wins, having lost one of their opening five league games. Only one striker has found the net so far this season – Sam Vokes in the 1-1 draw at Leeds United on the opening day of the season. And that is the only goal Burnley have scored in open play, although they have found goals from set pieces easier to come by, with four from corners – three courtesy of Michael Keane – and a free kick. Dyche is bedding in a number of new signings, including three strikers in record signing Andre Gray, Rouwen Hennings and Chris Long, and he said: “The good thing for us it’s the early part of the season, we’re re-morphing the team into something different. “We’ve got new players, and the strikers haven’t took fire yet. “It’s fair to say over a season they will, at some point, not necessarily fire as in millions of goals but they’re going to score. “It’s great that they haven’t and we’ve still got good points on the board. “You can’t be too greedy in this business, it takes time for a team to develop and we are. “It’s the third time I’ve had to change a group since I’ve been here. “The first season was after six or seven months, we got promoted that season and I had to try to do it last season to try to do something in the Premier League. “Now we’ve lost players I’ve got to change it again now. “It’s very difficult to make it roll straight away. And he expects more fluidity and cohesion to come – as Burnley look to take advantage of three of their next four games being at Turf Moor. Dyche added: “The lads will give us everything and they’re still giving us everything. While Gray made his debut in the last game at Bristol City, Joey Barton is also getting up to speed in training, after signing 12 days ago. 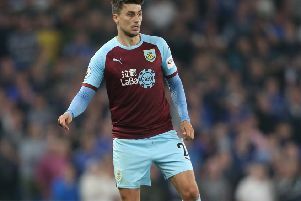 The midfielder hasn’t kicked a ball competitively since the last game of the season with QPR, and Dyche hopes the international break will benefit Barton, as well as the likes of Gray and Hennings: “He’ll use the break wisely, as will Andre and Rouwen Hennings. “It will be a good break for them and we’ll be working hard to get them up to speed. “Joey’s behind the curve just because of how long it’s taken to sort out, but he’s a generally fit fella. “Rouwen Hennings will get up to speed very quickly, and Andre. He’s generally in good shape but you know how fit our lads are and we want them at that level, so there’s still some work to be done. Dyche is looking forward to utilising what Barton can offer: “People forget the amount of experience he’s got, the level he’s played at, the different clubs he’s played at, the maturity that he’s got behind some of the oddness of course. I’m well aware of that and we spoke about it. “I think he wants to just getting back to enjoying his football, working hard at a club that likes to work hard.